It’s just after sunset on a clear night in Holyrood Park, and we’re at the foot of Arthur’s Seat, waiting to become part of the ‘walking audience’ for the first performance of the NVA Speed of Light. 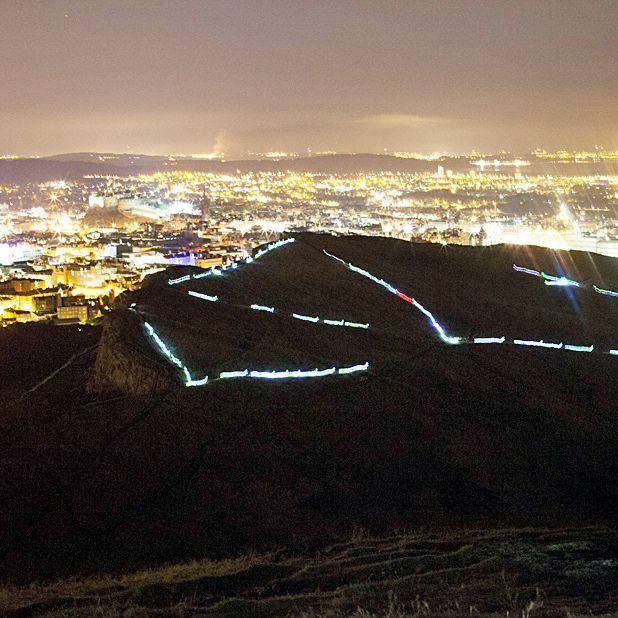 The runners taking part tonight are already kitted out in their light suits and the first have taken to the Salisbury Crags to begin their choreographed run. Stephen, our walk leader, and his colleagues are handing out ‘light sticks’ – illuminated white walking staffs – to each of the 70 walkers in our group, one of eight to take part on each of the 19 nights the event will be performed. Once the briefing is over and the photos posing as Jedi with our light-sabres have been taken, we wait for our guides to lead us off on our walk for the evening: two-and-a-half hours up Arthur’s Seat, part of the Edinburgh International Festival event in which a total of 4000 runners are also taking part. When we finally head off, light sticks in hand, the talk turns to why people have bought a ticket to be part of the walking audience rather than just turning up to watch. Some people are from Edinburgh and have never climbed Arthur’s Seat, and wanted to be part of the event. Some, like me, are running next week and are glad of the chance to see what it’s like beforehand. Some people are visiting Edinburgh for the Festival, while one woman was meant to be running tonight but turned up late and was offered a walking ticket instead. She’s decided that she got the better option. We’re the second group of the night to make our way up the hill, and it’s not long before the light suits of the runners are in view: co-ordinated teams of athletes criss-crossing over the landscape like fireflies, their lights and movements synchronised like a firework display. It’s a pretty impressive sight. Our walk is slow, and we make frequent stops – the groups are carefully co-ordinated, although a couple of times two groups meet and there’s a bit of confusion. As one walker says, it’s rather like herding cats. The speed of the walk is frustrating at times, but it’s clear that we’re part of the show – when we stop and see the other groups below us, it’s like watching trains snaking through the darkness. As we approach the top, we’re treated to beautiful views across to Fife and the Lothians, and fireworks over the castle at the end of the Tattoo. Speed of Light, 15 -19, 22-27, 29-31 Aug and 1 Sep, £24 (£18). Guided walking groups meet at Speed of Light base, Holyrood Park, every 15 minutes at 9.15pm, 9.30pm, 9.45pm, 10pm, 10.15pm, 10.30pm, 10.45pm and 11pm. Three short films reflecting on NVA's celebrated public art event Speed of Light.